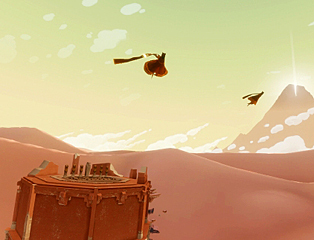 Journey is a hard game to talk about without sinking into hyperbole. This isn’t necessarily because it is a great game (though it is), but more because it is a game that takes aim squarely at our emotions. It’s not trying to make us understand something so much as make us feel something. 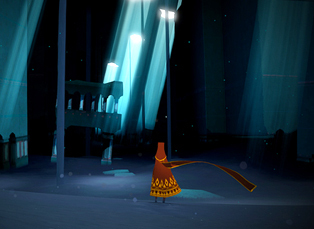 As such, Journey is a game best not explained at all; instead, it is a game best described. So please allow me to tell you about those I met on my two journeys. One: I met One in the rubble of the open area beneath the cascading sand and the crumbled bridge. I had been lost in this kind of pit for some time and was delighted to encounter someone else. They seemed equally happy to see me. I could tell One had never met a fellow pilgrim either, that we were each other’s first. We spent many minutes just dancing on the sand and shouting at each other, testing our voices before we even began to look for a way over the cliff ahead of us. Together we found the path and continued on our way. We climbed hills and slid down dunes. We traveled slowly, wistfully, more concerned about being together and the sights around us we were both seeing for the first time than the mountain on the horizon. When One sat down in the shade of a giant pillar and crumbled into dust, I didn’t know what to do. No goodbye. Just oblivion. I looked at the spot where they had been for some time, dumbstruck and sorrow-stricken, waiting for them to come back. They didn’t. Two: I met Two sliding down the dunes at great speed, silhouetted against the sun. I called out to them; they answered distractedly but didn’t slow down. I raced to catch up, almost embarrassed by my own desperation to be close to them. We went underground together. Well, I say ‘together’ but Two rarely paid much attention to me. If they got ahead, I would have to rush to catch up. If I got ahead and paused to wait for them, Two would just rush past without so much as a yelp. We were alone together, really, each on our own journeys that happened to overlap for a time. We came back above ground on the foothills of the snow-covered mountain. As the breeze knocked us around, I finally began to sense some comradeship, but maybe it was just the illusion of shared hardship. Still, we rubbed against each other for warmth, and that was enough. Halfway up the mountain is a giant lamp in a small room. Lighting it fills the room with a warm, homely orange glow. Two seemed convinced there was more to this room than the lamp and the image on the wall and jumped around it in their frantic-distracted way, shouting at stones and shadows. They were like a moth against a light bulb. I wanted to move on. We were so close. I stepped outside and called back, but Two either ignored me or couldn’t hear me over their own shouting. I took a few more steps. A few more. I stood on the far side of a narrow bridge, near a structure of some kind. One more step and the lamp room would be out of sight. I couldn’t hear Two over the wind anymore, but I could still see the blue domes of their voice resonating through the walls. I called out one last time, the blizzard sapping my strength. Then I turned around, abandoned Two, and continued alone. There was no Three. I climbed the peak alone. Cold. Frozen. Abandoned and an abandoner. The peak was right there, but as I took those final, frail, toothpick-leg steps up the mountain, I did not look ahead to my goal but had the camera squarely focused on the path behind me. Maybe Two would appear from behind one of the many lonely graves. Maybe they were cold and needed my help. Maybe they finally followed me. They hadn’t. I died alone. I transcended alone. One: I did not meet One for some time. I walked and I glided and then I had no power so I walked. I found orbs that I had missed last time. My ribbon grew and grew. But I was alone. I finally met One flying across the dunes, riding the small sand creatures. I joined them and together we flew and danced and sang. One’s ribbon was short. They’d jump once and be muted, coming back to me sheepishly for more energy. One seemed almost confused by my long ribbon, and I almost felt awkward about it, like I had just realized I was showing off. Eventually I realized that this was One’s first journey. That they didn’t really know what they were doing (as if any of us do). I felt paternal. I tried to show them how to jump, how to collect the orbs. I would stand next to the more hidden ones and shout and shout. Sometimes One would actually come and investigate. I lost One briefly during the great slide, but they caught up to me before the end and we went underground together. I sat patiently on the perches while One tried to climb the jellyfish-like ribbons, while they ignorantly and naively walked right up to the serpents as though there is nothing cruel in the world. My ribbon was twice long as I was tall; One’s barely touched their shoulders, even after all the orbs I revealed to them. How do you teach when you aren’t even really there? One was on their own dumb, blind, stumbling journey and I was on my own. We were together, in a sense, but we were so far apart. There was little I could do but tolerate their failings again and again. Still, I was glad to have a companion, and I think One was, too. We climbed the giant pillar, half-flying, half-swimming in the dust motes. I did all the work, raising the dust higher and higher so we could ascend while One floundered beneath the surface, seemingly unable to figure out which buttons would make them go up. I didn’t want to ruin their first journey by doing all the work, but I wanted to move on. Then, at the top of the pillar, I unthinkingly stood in the light while One was still far below. I meditated. The white being spoke to me, and I woke up alone. I walked out onto the snowy foothills. One would have to find their own path. Two: I walked up most of the mountain alone. Avoiding serpents, freezing, stumbling in the wind. Occasionally, the bottom of my screen would light up and I would turn quickly, thinking someone was shouting to me, but no one was there. Maybe I was seeing things in the blizzard. Maybe I was hearing things in the wind. I proceeded slowly, constantly looking over my shoulder and stopping just in case I wasn’t crazy and someone was trying to reach me. I made it all the way to the lamp alone. I stayed there for a while, just waiting. Then I saw the shouts as Two came running up the mountain. I shouted back, but they didn’t so much as flinch. They just kept on running, right past the lamp room. Running and shouting. Not at me, mind. Just… shouting. I followed them, responding to the shouts I knew were not aimed at me. I don’t know what we were saying. We just ran and shouted into the cold. I thought perhaps Two didn’t care for me at all. But when a serpent attacked on the higher slopes, ripping my ribbon to shreds, Two waited for me beneath some rubble, rather than carrying on while the beast was distracted. Two didn’t shout randomly anymore. They whispered, whispered at me. I responded, then we went on in silence. We stumbled up the peak together, cuddling and refusing to separate even as the winds picked up and tumbled us across the graves. I didn’t look back this time. I looked forward, nudging the analog stick to walk me more into my companion’s body than towards the summit. We climbed together. We died together. We transcended together. It would be easy to lose someone as you dash and fly jubilantly and impatiently towards the final peak above the clouds after your resurrection, but Two and I were restrained. We waited for each other. I think neither of us wanted to end this alone. Two reached the final perch first and was standing there waiting for me when I arrived. We walked into the light together. We did this side-by-side, Two and I. We did it silently. No one shouted anymore. No one whispered. We just walked. I couldn’t help but think of the person behind the pilgrim, the person under the hood, the person looking in on this world through the lens of his or her own television screen somewhere in the world. I couldn’t help but wonder who he or she was. Where he or she was. Maybe singular-they was an actual-they, a couple cuddling on the couch, sharing the controller. Or a parent talking her child through the game; or a child talking his parent through. As the light enveloped us, I realized that, really, we had never been together at all. None of us had. We were all alone on our own journeys, occasionally alone together. Alone like lovers on Skype, separated by an ocean. Alone like passengers sitting beside each other on a bus. Alone like customers in a queue at the checkouts. Both there, both together in some spatial and temporal way, but both ultimately on our own, separate journeys. As a single, lonesome star ascended from the mountaintop (mine, not ours), I realized that this is what Journey is all about. At least, what it is all about for me. Not companionship, not friendship, but the loneliness that is other people. Maybe that sounds depressing, but I don’t think it necessarily is. We have countless stories about how people love each other and how they hate each other. 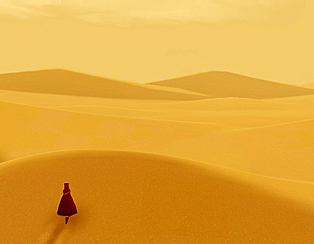 Now, in Journey, we have one about how strangers just kind of exist on their own trajectories, and those existences can sometimes get tangled up for a time. I think that is kind of beautiful. 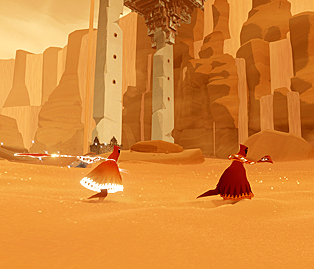 Journey, from thatgamecompany, is available now for the PS3.